You’re here because you probably know that installing solar panels in your home can save on your energy bill. You are correct. 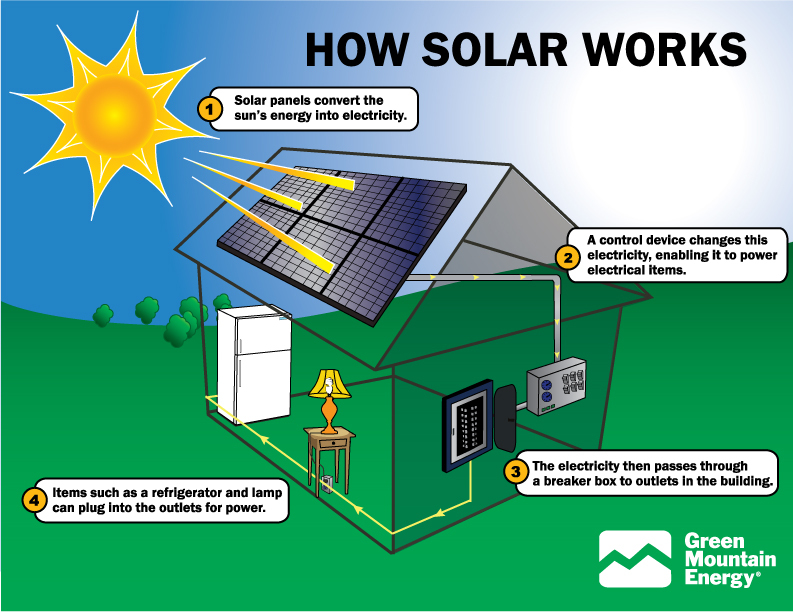 Although like any major project you need to thoroughly research before deciding if solar power is right for you. What is Solar Power and How is it Generated? 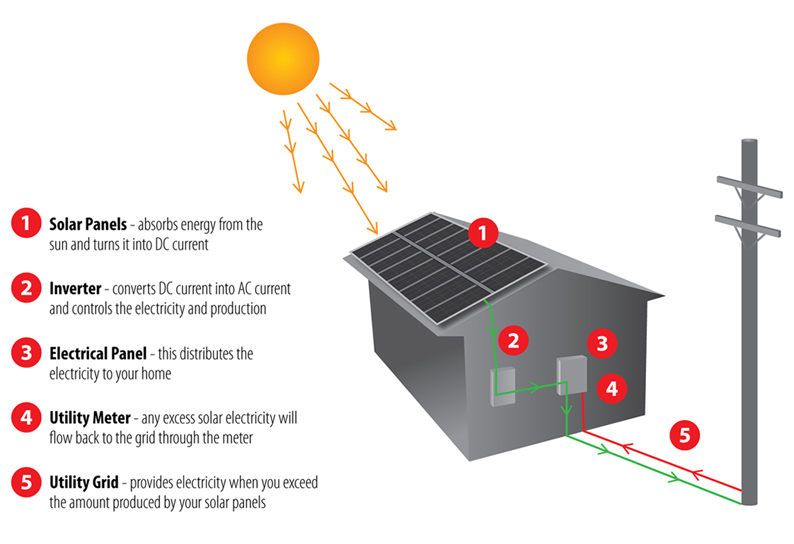 Solar power technology emanates from the idea that the sun’s light energy can be trapped and harnessed as electrical energy via a combination of special panels, batteries and a DC to AC inverter. In such a project, solar panels take the central axle on which the wheels of this green technology run. They form the primary transducers that convert the light energy into useful electrical power. After inversion of this power to AC, it can be supplied throughout a building or home via a suitable electrical installation just like the standard grid supply. As mentioned earlier, solar panels are primary powerhouses in the generation of this kind of green energy. The panels, which come in different sizes and specifications, convert the sun’s short-wave radiation to electrical energy. A single panel contains millions of interconnected photovoltaic modules packed closely and protected by a transparent glass panel. The photovoltaic cells used in most solar panels today are basically miniature photoemissive materials (emits electrons when a ray of light of a given wavelength shines on them). Since they are interconnected, the electrons dissipated by the sunlight pool to form a larger stream now referred as an electrical current. The current generated, which typically flows as a result of the potential difference between two terminals, constitutes the bulk of the electrical energy harnessed. The power produced can be used directly or first taken through a unit of batteries and inverters for a more consistent supply. So in a nutshell, the array of photovoltaic modules packed in the solar panel traps the light and converts it to electricity. Most people may not know this, but solar panels and the solar power technology has been with us since the 1950s. It was when they were majorly used to power extra-terrestrial installations (e.g., the Sputnik 1 and US Explorer 1). Back then, the panels were only a reserve for costly scientific explorations, and they were also hardly affordable. 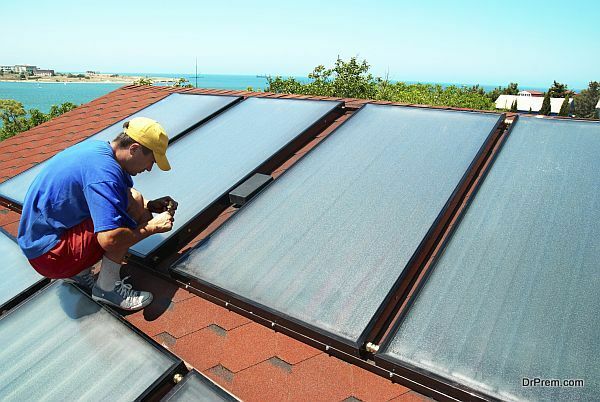 Fortunately as a consequence of the advancement of technology, the cost of solar panels has decreased tremendously and are now readily available in most hardware and roofing stores all over the world. Even better, you can order yours online from reputable dealers or even big box stores like Home Depot. What Do I Need to Know Before Buying Solar Panels? Solar panels are available today in a broad range of specifications. The specs are mainly based on the efficiency tests of the panel and the construction material. Even though solar panels with higher efficiency are desirable, you may want to avoid buying anything with a more than a 20% efficiency rate. 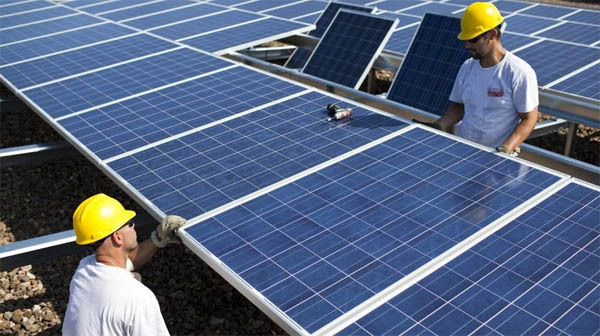 Such panels are known to have a shorter life and are equally more expensive. 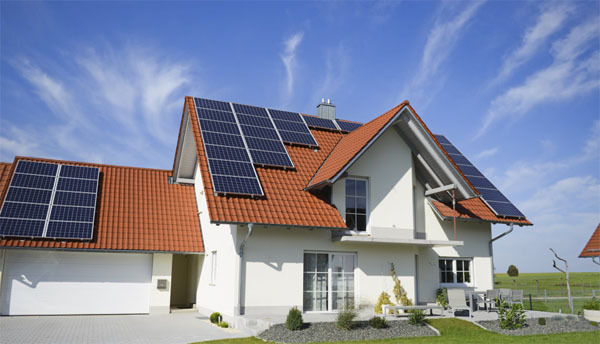 If you need solar panels for your home, then anything with a 5%-15% efficiency will comfortably fit your bill. On the same note, make sure you inquire on warranty period issued for the panel you’re going to purchase. Insist on a panel with a manufacturer’s warranty of more than 20 years. Usually, such panels are the most durable ones. The number of solar panels you might need for your home is directly tied to your average monthly power consumption. Your monthly consumption is simply the amount your home utilizes on an average day then multiplied by 30 or 31 (days). An energy meter could come in handy for more accurate representation. In case you do not have an energy meter, you can still use your past electric bills as a worthy estimate. To be safe, you might want to use the highest usage ever recorded on your monthly bills, just to leave room for a deviation allowance. The other factor to put into consideration is the amount of consumption you’re looking to cover using the solar panels installation. You will need more panels for a 100% grid take-over than you would for a sizable occasional backup power plan. Again, if you want to live completely off the utility grid you will have to invest in a more sophisticated DC to AC power inverter unit. Lastly, the average number of peak sunshine hours per day in your area should also be factored in when calculating the ideal number of panels required. Homes in the tropics might use fewer panels than those in temperate and polar latitudes. For a quick estimate, let’s assume you live in Miami, FL ( where the average number of peak sunshine hours is 4.5 per day) and you have a monthly power consumption of 100KwHr as reflected in one of your recent energy bills. In this case, if you need to generate 100% of home’s power consumption using solar panels you might require four solar panels rated at 200Watts each. This estimation is based on the fact that a simple mathematical calculation reveals that such a homeowner utilizes an average of 760 watts per day. In short, all the three factors have to be considered before you decide how many panels you’re going to purchase. This is influenced by the amount of energy you want to produce. For example, If you go completely off the grid and adopt a solar power project for your home, then your installation is likely to be more complex than if you were looking at a backup or partial power plan. Additionally, it depends on whether you want to do-it-yourself (DIY) or planning on hiring an installation contractor. Considering all these factors, with the help of an experienced electrical contractor, the project could take anywhere between 5 days and two weeks to complete ( depending on its scale and the manpower available). That said, it may take a month of fine-tuning & minor tweaks before a fully fledged solar-panel power project can comfortably generate 100% of the power consumed by a large-sized residence. There is no reason to have to buy electricity!! All new buldings should have solar power as well as businesses! All older buildings should be refitted for solar power and it just blows my mind that we could do this but who could or should pay? Just think of what could be done with all the money you will save when you install these! Let’s go everyone! Solar is awesome! Yep solar saves the world. I put solar on my 35 year old house 3 years ago. It cost $25,000 but they wouldn’t allow me to produce more than I use… it would put Edison out of business. On the upside my average bill is about $10-15 per month, my house was appraised at $45,000 more and my house is at 73 degrees every day all day. If I were to get an electric car with all the rebates and money I save not paying for electricity I could drive the car for free. I’m looking into this now. Excuse me Greg, I don’t quite understand how solar panels work. Can you please help me understand. First of all how do you pay the $25,000 and can you make monthly payments? And to whom do you pay? Sure Marie. About 5 years ago I had double pane windows installed at my home. Two years after that the same company contacted me again as they became a solar power rep/installation company. They sent a rep to my house and I had to have two years of electric bills so they could figure an accurate average monthly use. Then they informed me that I needed nine panels based on my home. So I am leasing them through the installation company for $45 per month for 7 years and I will have to pay off about $7,000 at that time. If I had purchased it outright it would have been $25,000. That’s what I meant. I would love this savings however we live in a town that doesn’t have many installers. Thierry, the leasing of the panels (and then I am going to BUY out at the end of the seven years) had nothing to do with the value of my home because I will own the panels when the lease is up. When my house was reappraised, the adjuster said the addition of the panels is a $45,000 upgrade and the appraisal reflected as such. So yes basically the value did increase, I will own the panels and if I were to take any equity out of my house now I could take that $45,000. I have had solar for 2 years now and my electric bill went from $1200 a month to $40!! I’d like to experiment the cost effectiveness of solar power calimed in several articles I read over the net. I’d like to put the smallest unit possible to run my porch and backyard lighting. I know next to nothing technically about installing such experimental panel. The articles are rather technically overwhelming to me, though I read an enthusiast just do it the DIY way!! In the coming week I am checking the stores in town dealing with sales of solar power components. Can some one guide me what I should do, please. I READ ALL THE DETAILS… I WANT TO USE SOLAR PANELS.. CAN SOMEONE SUGGEST ABOUT TOTAL COSTING OF ABOUT 8 KW? Is it Time to Install Solar Panels on Your Roof?